Dunkin' Donuts Is Officially Changing Its Name. Here's Why. We apologize if this is giving you flashbacks to the horror of IHOb, but yet another breakfast-based chain is changing its name. The rebrand bug has bitten Dunkin' Donuts this time, but we're happy to report that you won't be swinging by Dunkin' Burgers anytime soon. 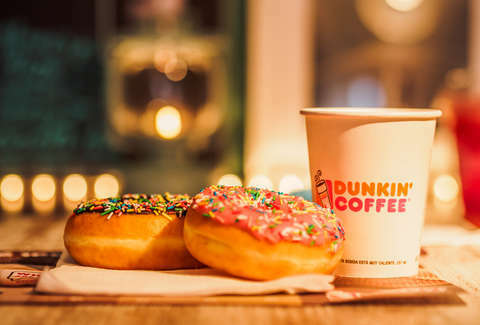 On Wednesday, Dunkin' Donuts announced its transformation into Dunkin', part of its increasing focus on drinks. The change will officially happen in January of 2019, but when you consider that the donut juggernaut has been using the tagline "America Runs on Dunkin'" since 2006, this has been a long time coming. Just think of it like your cousin Darrell has decided to go by D -- a cool, new, fun, casual self who, much like Darrell, serves coffee. The only real change here is that the signage on the stores and cups and whatnot will now display the new name. Dunkin' (see how seamless that switch is?) has been shifting more toward drinks for a while now, like when it cut 10% of its menu earlier this year. According to CNBC, drinks make up 60% of sales right now, so clearly there's food to be had at Dunkin' still. Chief Marketing Officer Tony Weisman stressed that in a statement: "While donuts may no longer appear in our logo, we remain committed to serving our signature donuts and will continue to offer new and seasonal varieties to delight donut lovers everywhere. There is no Dunkin’ without donuts!" As long as it doesn't include burgers, that's fine with us.